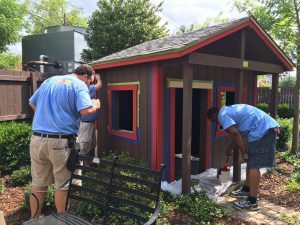 For the past 6+ years, CarMax in Hoover has come to the Ronald McDonald House downtown. They always send a group during the summer to complete a big project and this year was no different! Years’ past projects have included re-painting our exterior hand railings, re-painting our courtyard fence, building closet shelves, re-painting our rocking chairs, sprucing up the landscaping in the courtyard, and more. This years’ group came out and repaired our outdoor playhouse that was in desperate need of a makeover! In addition to replacing some of the rotting wood and re-painting, they also built a small wheelchair ramp leading into the playhouse so it is accessible for all kids. 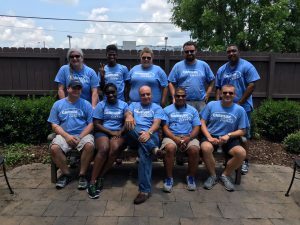 While a few were working on that project, others from the group were replacing some of our potted plants, repainting our bench, organizing our pantry and cleaning out closets. This group of hardworking, efficient employees did a great job and all of us here at RMHCA appreciate their hard work and dedication to our mission! In addition to their day of volunteer work, CarMax also pledged $1,000 to RMHCA for us to use towards our mission of keeping families close. Thank you, CarMax! If you are interested in volunteering, like CarMax, reach out to Emily Wright, Volunteer Coordinator at emily.wright@rmhca.org. There is more information on our website under the “Volunteer” tab as well.